MSLAN LED lights magnifying glass is the best gift to the aged, .30X magnification , imaginative unique LED lighting design are great to meet the requirements of olders. Made with scratch resistant, shatterproof clear optical grade lenses designed for seniors, students, professionals, people with low vision and macular degeneration. The jumbo size 110mm 30X magnifying glass is ideal for reading books, newspapers, and maps, examining fine prints and images, circuit boards, coins, stamps, gems and antiques. Portable and tough enough to take with you wherever you go. The durable construction of the lens and sturdy handle means even kids can use it safely for science experiments. Oversize View: Jumbo 4.3 inch scratch-resistant magnifying glass with 30X magnification. 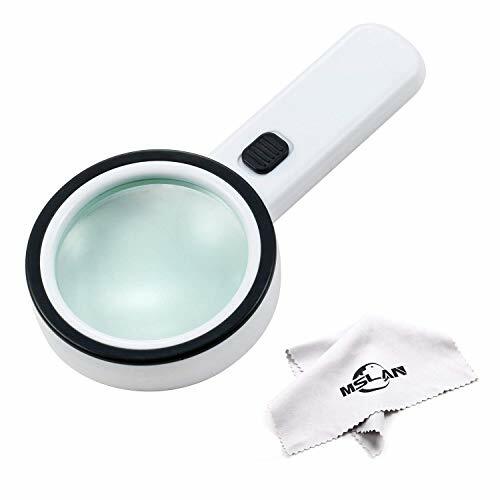 Optical Quality: Clear magnifying lens with comfortable ergonomic handle suitable for seniors, people with low vision, and macular degeneration. Bright LED and UV Light: You can see objects clearly in dark or insufficient light conditions with this dual LED light source. The UV light works as a counterfeit detector for things such as the paper currency, passports, Credit cards, and traveler's checks etc. Great Elderly Gift:clear magnifying lens great for seniors, excellent for small print on coupons, prescription and leisurely reading. Compact and stylish design, portable weight with gift box. If you have any questions about this product by MSLAN, contact us by completing and submitting the form below. If you are looking for a specif part number, please include it with your message.